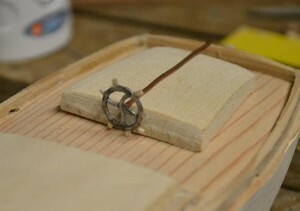 When we had finished last week Dad suggested that he would attempt to create a chaff cutter wheel. I knew he wasn’t really looking forward to it and had resigned myself to using one of the watch cogs as a wheel, which would have looked wrong. I was amazed to see the result of his efforts. We have a genuine mini Westmoreland size chaff cutter wheel. So if we have a wheel we will need something for it to turn. Time to look at the rudder and how we are going to fit it to the barge. The main post is made from balsa wood and the blade from pine. 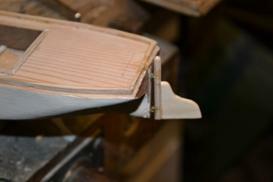 We opted for four small pieces of drilled brass, two inserted in the stern post and two in the rudder post. Getting the gudgeon pin to line up was a task and it reminded me of when we put Cambria’s rudder on for the first time. Indeed we were thwarted that day until some adjustments were made to the hinges. Incidentally, Dave also tells me that there is now a nice video of the Medway Match 2012 available as a DVD through the Edith May website. You will recall that Cambria won her class in that race and Dave tells me that there is some nice footage of Cambria in the film. The DVD is £12.50 from the merchandise section of the Edith May website at http://www.edithmaybargecharter.co.uk/shop/category/merchandise/ . Nice Christmas present idea? Hi , this is very interesting. I would like to have a miniature hand powered chaff cutter that could be used in rural areas with large families to cut up fresh veggies and also introduce this as a product in our cities in Kenya where women who sell veggies have to cut it up for their customers who have to line up for close to an hour. Business model being veggies cut up for you in 30 sec. Price the machine affordably for a small kiosk owner and we’re riding the wave.